Laura is covering a whole wall in old shutters. You can see the entire project, inspiration, and process on her blog here. I am loving this project, and I want to try a similar project in my booth space. Thanks Laura for sharing. I had picked up a couple of old shutters at a garage sale and painted them blue, and had my son make me a flower box to put on this window. "I was searching the web looking for ideas for what to do with an extra shutter I have and came across your site. Here is a link to a blog article I wrote about how I used a shutter to make the top bunk safer for my daughter." I wanted to send you a few pics of our stuff...my husband and I just started this in the past year and had our first craft show 2 weeks ago under the name Encore! Designs... "Home furnishings restyled and renewed for a second performance" (I was a drama major in college, thus the name) It was a lot of fun getting ready for it and actually making money at something we put together. We love old doors, shutters, posts, dressers, etc. and have had fun doing it together. Here's a neat little project. I had a shutter with damaged slats. I removed the slats and replaced them with a piece of metal. Added the spindles to the sides to hide where I had nailed the metal. I fixed the slats at the angle I wanted and nailed a thin piece of old paneling to the back. 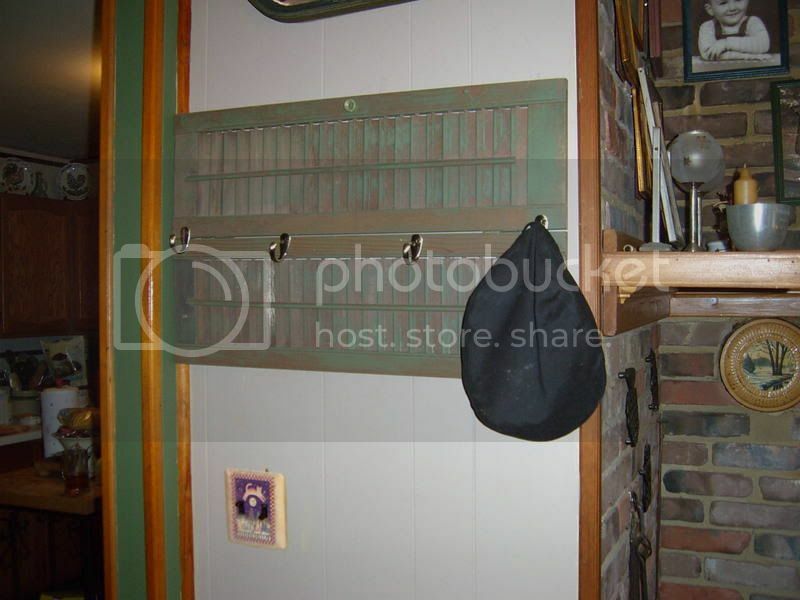 The metal is magnetic for notes etc, and the slats are great for mail and photos. I saw this idea at an area Antique Mall. Take a long shutter, attach some brackets, drill holes in the brackets for the long spindle. This spindle is from a crib, you could also use a dowel. Makes a great quilt or towel rack. Or a place to display that tablecloth or hankie collection. This shutter was made into a window valance. By adding the leftover molding to the top, a Plate/display area has been created. This is very easy to do. 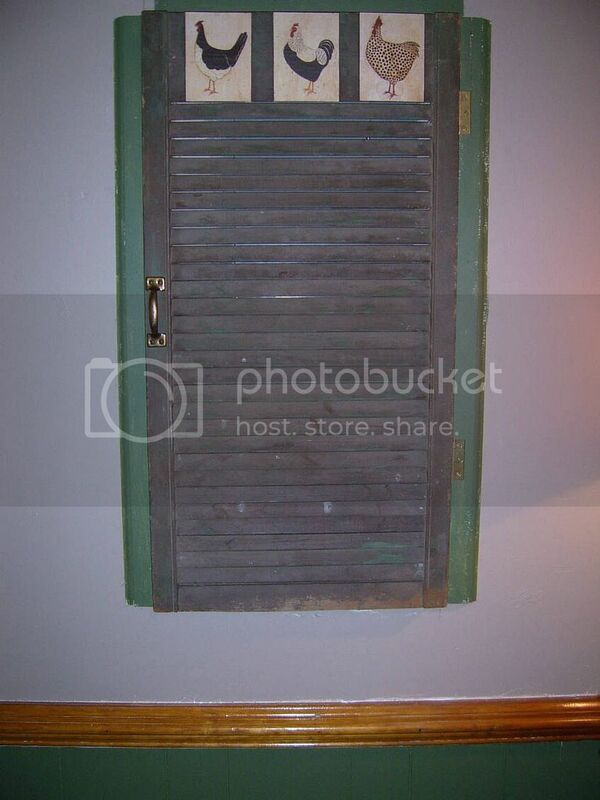 I took a set of old shutters, you could use a single shutter or a hinged set as I have here. White or painted shutters work great for this project. I slid some pictures or post cards through the closed slats, and clipped a small clothes pin on the other side to keep them from sliding out. This makes them easy to change as you want. This would be a great way to display Christmas Cards, photographs or just about anything that is flat. It could be hung on the wall or stood on a side table, or stand alone by itself. This is an all around fun and easy 10 minute project, once you have the shutter you are on your way. "Just wanted to share something I did years ago with a small shutter. I used the small adhesive backed blank labels and put all of our most frequently used numbers on them then I opened the shutters and placed a phone # label on each of the slats. When it is closed you cannot see the numbers. This shutter had a little piece of wood in the center verticaly that you opened and closed it with. Painted a little floral design on the top and it became wall art by the phone. Really worked neat for us. Just wanted to share. Have a good day." Thanks ellens_joy for the great Idea, a Few weeks after she told me about this project, I found this one painted this way at a garage sale. I think it was designed for this purpose. See how the numbers are not visible when the slats are down, but are when the the slats are turned up. The Raggedy Princess submits this shutter project. Gayle Writes: "Here is a project my husband made me for a Christmas gift. I had gathered all the supplies and planned to make it for myself, but then was injured in an ATV accident, so I couldn't get it done. It's a clothes hamper for the bathroom. The back panel is made of smooth pegboard so between that and the shutter front there is plenty of ventilation. The lid is hinged for easy access. Gayle in UT"
This book has a great shutter shelf on the cover. Click here to jump to their site. Shutters are used as the sides of this this bird house (left) that uses multiple pieces of reclaimed building materials. I've been making shutter birdhouses since being inspired from Robolady's site. Been finding tons of shutters at fleamarkets in all different sizes so I have alot of projects planned. I had the cute angel in my stash and thought the old drawer pulls would work well as perches. Old ceiling tin on the roof to keep the birdies dry! This is my 4th one with shutters and more planned! This shelf was made from an old shutter, molding from an old bed frame and wood removed from a friends house during a remodel. I've embellished it with a few spindles on the ends and in the upper center. It took me about 20 minutes to make. This is a really easy project. Add a mirror or add a vase, great ideas greenbean. ttrbb from HGTV T2T Message board made her own shutter valance and the shutter window box below. Shutters as a hangers, organizers, and Display. One of these hides the breaker box. Toots used her shutters as a planter. "The shelf is down inside the 'box' so that the pot doesn't show...."
These pieces are done by artist Mark Orr, click the picture to view his web site, with more great ideas and pieces to purchase. Thank you Mark for permission to link to your wonderful art. These shutters were hung on either side of a window, to add interest, yet not block out light. A pair of shutters propped up against the wall on the end of the bathtub add interest to a bare area. Shutters can strategically hide an unsightly electrical outlet. A pair of shutters with a wreath hung in front, makes an interesting alternative to framed art.